As a Pitt alumnus I am all too familiar with the menial perseverations of a frustrated fanbase. In a typical year, Pitt fans look at their .500 record and begin chatter about bringing back the old script Pitt logo. Well last year they got their wish - the script Pitt logo is back for all sports and just look at the results. Because of the new/old logo Pitt beat their arch rival, beat the eventual national champion (Youtube link) and still couldn't fill Heinz Field. All of that is to say I think most uniform news is meaningless. This year, Army will add one meaningful addition to their helmets. ESPN looked at all the notable uniform changes this year, Army will have a decal in memory of Brandon Jackson placed on their helmets. It looks good, and apparently it may stick around for a while. Clearly, #28 is loved and missed by many - if you are interested in wearing some #28 apparel there are some classy designs that you can personalize here. Looking ahead to another great season, 2017 looks like it could be a special year. Bleacher Report projects the 2017 top rushing offenses. They chalk Army up for #1. Not everyone will agree with that, but not everyone likes Army or follows their year to year roster strength. Army opens up on Friday Sept. 1, hosting the Fordham Rams in a rare Michie Stadium night game. Army felt the wrath of Fordham two years ago, getting the ram's horns in their 2015 night game at Michie. The recent series has been tight: a 2-1 edge for Army since 2011, the teams have split the last two games. A quick glance at the Fordham roster shows that Fordham returns perennial All America running back Chase Edmonds (250 all-purpose yards in the 2015 game) as well as QB Kevin Anderson (330 all-purpose yards in the last meeting). Anderson won the 2015 duel - luckily our QB comes back too, Bradshaw had 250 all purpose yards in that 2015 loss. It's been a good 8 years since Fordham recommitted to their football program and just look at the good they have done. They have participated in the last three FCS playoffs going 2-3 in those games. Fordham has done a lot in the last 8 years to re-emphasize football - a look at recent results shows how that re-emphasis has paid off for them. Since going 1-10 in 2011 Fordham has simply gone 58-18 with three FCS playoff appearances. Fordham is ranked FCS # 22 in the STATS FCS top 25. Lenoir Rhyne has a collection of yearbooks available, the Lenoir Rhyne Hacawa. It's another good one, this one brings to light the works of the Lenoir Rhyne Bears football team. The Bears have experienced a recent resurgence beginning under head coach Mike Houston and continuing with Former Army coach Ian Shields. After coaching for Army, Lenoir Rhyne was the first stop for former Army offensive coordinator Ian Shields. Previous West Point coaches Rich Ellerson and Tom Simi as well as former QB Trent Steelman are now all members of Coach Shields' staff at Jacksonville University. 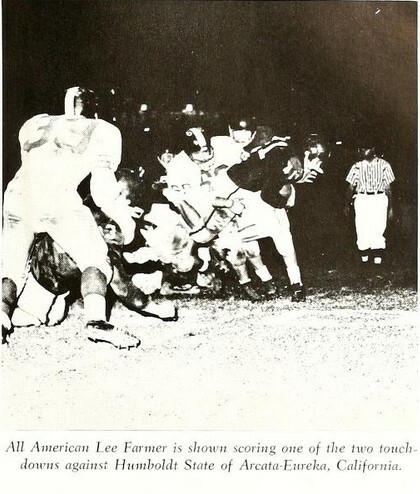 Lenoir Rhyne's golden era was the stretch of time during the entirety of the 1950's and the early years of the 1960's. Former Lenoir Rhyne Bears head coach Clarence Stasavich directed the team to three early minor postseason bowl appearances in 1951 (Pythian Bowl), 1952 (Cigar Bowl) and 1955 (Palmetto Shrine Bowl) as well as back to back NAIA championship game appearances in 1959 and 1960, with another championship game appearance in 1962. Coach Stasavich's early success using the single wing formation dedicated him to the concept and his teams operated mainly out of that formation in a time when most of football had moved on to T formation backfields (and beyond). The yearbooks are great reminders of Bears history with photos and game notes available for many of their best seasons. Photographs, by nature don't age particularly well, but the spirit and lore of these past Lenoir Rhyne football seasons do, and it makes for a classic yearbook addition. This collection comes from what is a nice aggregation of small college yearbooks. We've seen school-led yearbook digitization projects and, this one, Digital NC is another state-led digitization project. I'm particularly excited about this one because it gives me some very nice content for my yearbook posts and include some relevant football schools, so we have a bunch more yearbooks to look forward to. The next cycle of Army/Navy games (what a relief to never have to call it Navy/Army again) was announced today in Pennsylvania. No surprise, Philadelphia will host four of the five games from 2018-2022. This year’s game will be Saturday, Dec. 9 at Lincoln Financial Field at 3 p.m. After that, Philly will host the match up in 2018, ’19, ’20 and ’22. The 2021 Army/Navy game will be played at Met Life Stadium in New Jersey. The 2021 game in East Rutherford will mark the fifth time Army and Navy have played at that location, and it will be the first time at MetLife. The 2022 game will mark the 91st time Army/Navy has been hosted by Philly. I'm glad to be back, thanks for dropping by, and I hope you'll stop by frequently regarding another thrilling season of Army football. UPDATE: Saturday Blitz has an Army football preview for you to check out. They miss on some of the roster moves, but they have a pretty favorable outlook on the year. Go on over for one more preview. Troy Nunes is an Absolute Magician offers up a power ranking of New York state college football. Call me crazy, but I'd like to think Army would thump Cuse. It's a new year, but last year Syracuse gave up a full 100 yards per game more then they gained, and that's an environment that Army can flourish in. I'll put the NYC masthead up until the season starts just because I think West Point brings New York's best brand of football. Athlon's preview lists Army at FBS #80. College football news has an Army 2017 preview out. Forgotten 5 has been around for about a year now and it's a good looking website largely focused on the have-nots of college football. Their Army season preview is a couple days old now, as is the link to Forgotten 5 on my sidebar. SB Nation has Army's preview up, They see the Cadets going 6-6, somehow rounded down to 5.2-7.8. Danno's Lair has a preview up. Old boy put a lot of effort into the preview, so if you haven't seen this site, make sure to go over and check this one out. A triple-option attack that ranked second in the nation in rushing last season (339.5 ypg) returns its top five ball carriers. The group is led by junior fullback Andy Davidson, who made the move from linebacker following his freshman season and ran for 961 yards and 12 touchdowns. Another junior fullback, Darnell Woolfolk, capped a 600-yard season with a career-high 119 in the bowl victory over North Texas. Sophomore Malik McGue, a jack of all trades last season who even served as the No. 3 quarterback, impressed at slot back during the spring. College sports madness lists Army at #76. It was the surprising play of the defense that took Army to the next level. They ranked fourth in the country allowing a mere 291.5 yards per game. It helps when the offense can run out the clock, but the defense was very good too. The depth of the front three is strong and that is very important for a line that is undersized. There are significant losses at linebacker with Jeremy Timpf and Andrew King moving on, but Kenneth Brinson and Alex Aukerman, who tallied 59 tackles and 7.5 sacks last season, are a solid duo to build around. Hero Sports has Army in at #72. Yesterday's Army preview by Get More Sports is the most recent preview. They missed the recent blurb that QB Chris Carter will miss the season, pretty big loss considering how McGue is taking slot reps now and in light of how Coach Monken has shared reps through with the top two QBs. I couldn't be more pumped to see how this season plays out.